I went with a friend to Outback on a friday evening, we beat the dinner crowd & was offered a table immediately. We weere served a table near the 'bar' so it was relatively noisy but acceptable. The waiter who took our orders gave us advice & offered us a small sample of their steaks FOC after much thinking/consideration on which steak to choose as it was our 1st time there. How generous. 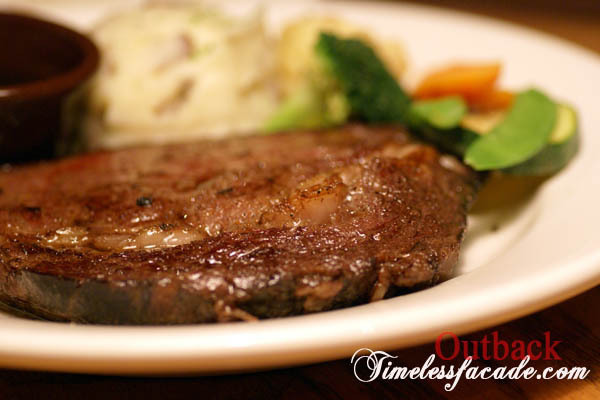 We fnally made up our minds & ordered the Victoria's Fillet & Outback Sirloin 8oz & went back to think about our drinks. Bummer. The waiter placed the order for our main dish & again offered us some drink samples & we decided on their cocktail Sangria which is alcohol green apple juice & a little soda. Not bad but i found the alcohol overpowering as it was bitter & I highlighted it to him when he came over. Immediately, he offered to add more apple juice to my drink to reduce the bitterness. Thumps up !!!! He didnt recommend the dessert when we asked him, instead he recommended an appetizer: Bushman Shrooms which are fried mushroom with their special ranch sauce. It was tasty but sort of average. The steaks were impressive & delicious & succulent despite being medium-well done. I'd recommend this restaurant anytime for whatever event. Service is top of the class. Food is top of the range. Though the prices are a little steep. Majority of the patrons are caucasians.... Perhaps that would explain the prices. 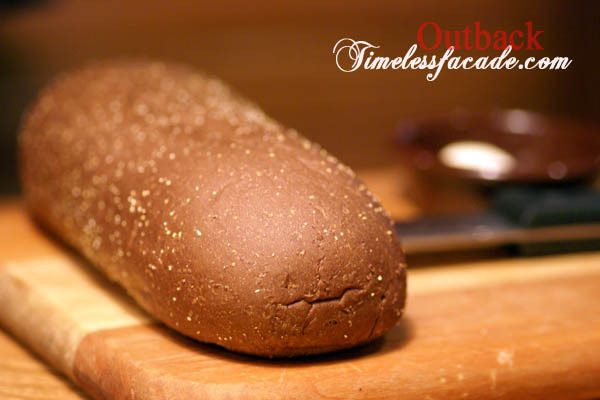 I realise that I've never written anything about Outback Steakhouse despite quite a few visits to to the restaurant both in Singapore and overseas, so here goes. Popped by with my gf on a not so quiet Thursday evening. The interior is cosy and cheerful with wooden booth seats for extra privacy. Signs and stickers adorn the wall with overhanging lamp shades for a casual laid back atmosphere. 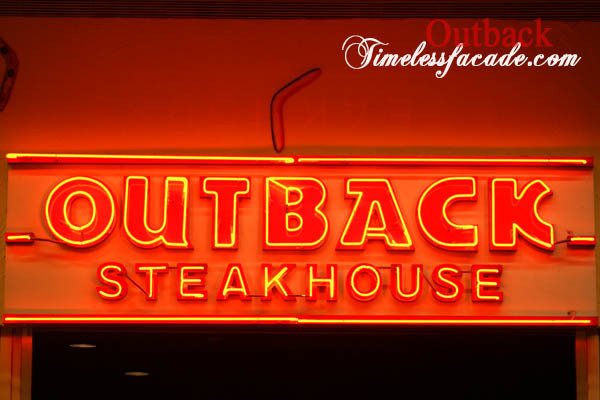 Interestingly, while Outback is supposed to embody the spirit of the Australian outback - rugged, friendly and casual, this successful chain actually started out in the US and the owners have never stepped foot into Australia! So much for authenticity I guess. Complimentary Bread & Cheese Fries - The complimentary bread was relatively huge and came served on a cutting board with a knife and butter. I thought it was rather average tasting though. I'm a sucker for fries and cheese so anything that combines these two ingredients together works magic for me. 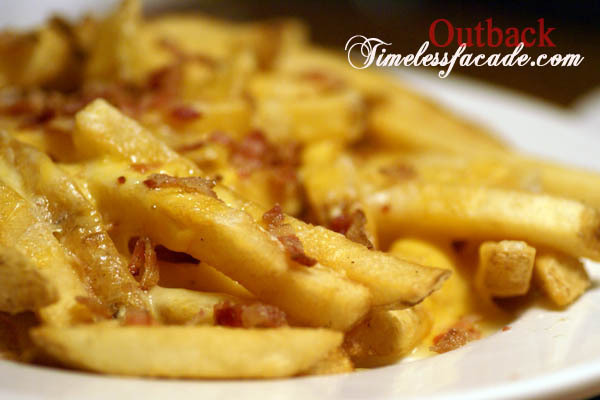 It definitely helped that the fries were chunky and crispy while the cheese was thick and had lots of bacon chips in it. Prime Minister's Prime Rib - At 8oz, this is one of the smaller prime ribs that I've had (I usually prefer a 10oz or 12oz). Slow roasted in an oven, the medium rare rib was succulent and tender but I did find it a little too fatty. It could have done with a dash of salt and pepper as well to complement the natural beefy taste of the rib. There's an option to add on homemade mushroom sauce or peppercorn sauce, but at $6.90 a pop, I'd rather pass. Sizzling Chicken - The sizzling chicken had me salivating at the fragrance it emitted at the table. However I did find this dish a little lacking. The boneless chicken came across as a tad too dry though still reasonably fibrous. Nothing special but still very palatable. 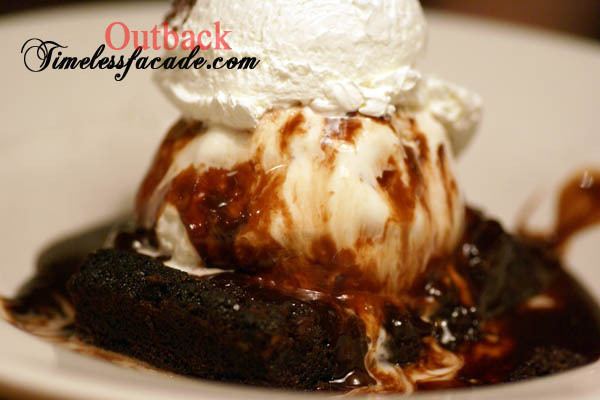 Chocolate Thunder from Down Under - Warm and rich chocolate sauce drizzled over soft and moist pecan brownie with a nice smooth scoop of vanilla ice cream. Whats not to like?However, at $15.90 for this dessert, I had expected a humongous slab of brownie topped with yet another humongous scoop of ice cream, enough to stuff 2 people. What I got was really disappointing, size wise. To be fair, the brownie and ice cream was bigger than usual, but only by that much. A very nice and sinful dessert! $111 for 2 pax is certainly on the high side for a hearty but relatively unimpressive dinner. Food quality is above average at best but what I like is the casual setting and friendly service. Soft drinks are free flow if you order a glass, so please don't spend unnecessary money by ordering 2 glasses when you can order 1 glass to share, alongside free ice water.